The thyristor, a semiconductor device, used to switch electric current helps in precise control of power for industrial heating applications. Thyristors being robust offer silent, reliable and long life control suited for industrial environments. At Enerzi Microwave Systems, with over a decade of experience in engineering state-of-the-art heating solutions, we have developed heavy duty thyristor drives designed to provide precise control of AC loads with better surge handling capability. These heavy duty thyristor drives are assembled with highly reliable triac/thyristors which can withstandrepetitive peak off-state andreverse voltages up to 1600V. Our thyristor drives come with digital control allowing accurate power control compared to analog based SSR/ thyristor drives. With built in snubbers, thyristor drives offer better dv/dt surge protection. For resistive or non-inductive or slightly inductive loads, our thyristor drives can be used without any derating. It comes with a well designed SMPS to power up the electronic modules which makes the product compact and efficient. 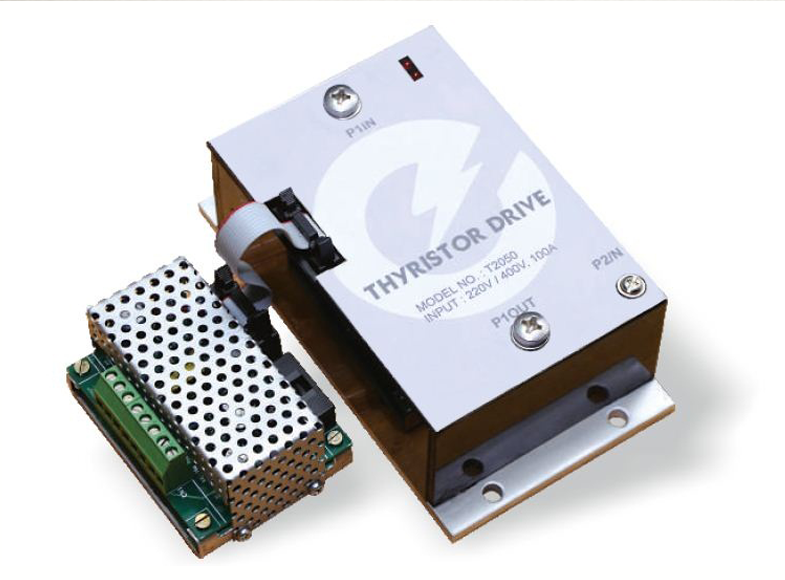 A single phase thyristor drive consists of a thyristor and SMPS module. These drives are completely modular, offering flexibility to connect up to three additional thyristor modules for each additional phase. A single SMPS module can be used to power a maximum of three thyristor drive modules. In a three phase system, three module configuration can drive the loads connected in star with (or without) neutral and delta (or open delta)network connections. These can also be used for 2 phase networks. The instrumentation series of thyristor drives come with many advanced features like energy counter, load open circuit, short circuit detection and protection. The drive module continuously monitors to detect short circuit conditions and turns off the module before over current crosses the set threshold. A semiconductor fuse is also provided to protect the module in case of short circuit. All the electrical parameters like phase voltages, load currents, power on each phase, total energy consumed (energy counter in kWh) are monitored on 7 segment display. A keypad is provided to scroll through and view various parameters on the display and reset the energy counter. 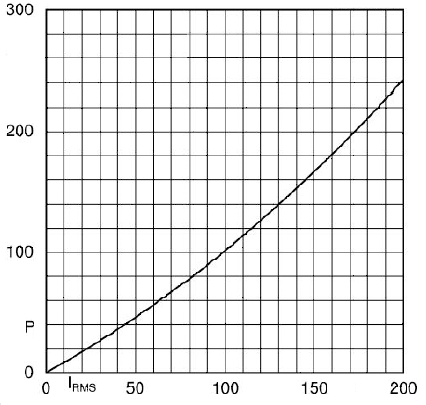 For Thyristor drives with instrumentation, put S in place of M.
Below graph depicts the power dissipation in watts vs rms current in A.